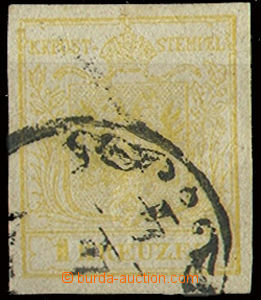 1851 1851 Newspaper Mi.6, typ III.b, blue Merkury 0,6kr, vertical pair, cnl. Bergamo (L-V),tight margin on the right bottom.Fotoattest from F.Beneš, very nice! 1858 1858 Mi.16, blue,newspaper, owners mark Dr.B.Rieger, margines to check. Nice quality. 1858 1858 Mi.16, blue, newspaper on address eticket, ample margines, light cancel high quality piece. 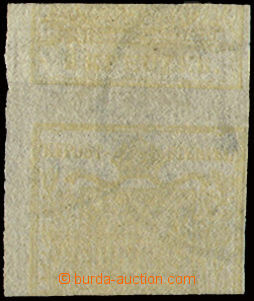 1861 1861 Mi.23, grauviolett, newspaper stamp on the address eticket with full address, light bend very good margines, cancel Krumau 17/2.,small bend through stamp. 1863 comp. 13 pcs of cut-squares + 4 pcs stamp. IV. issue 15 Kreuzer, Mi.28. 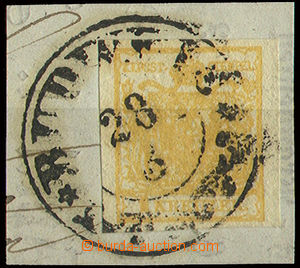 postmarks as: Admont, Baja, Rohrbach, Neugedein, Feldkirch, Hannsdorf, Bielitz etc..
1863 V. issue, comp. 5 pcs of stamp. 2 Kreuzer, Mi.30. Z from-that/of-it/ 3x cut square, CDS Linz, Prag. 1867 VI. issue - production vady: machine offset 5 Kreuzer + 10Kr, smudged print 2 Kreuzer + 10Kr, paper crease in paper 2 Kreuzer.